There are a bunch of tweaks and fixes I still need to do for the 3D changes. 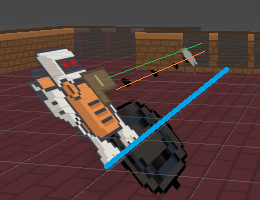 I am currently holding off changing collisions/physics, since they technically work (good enough). And I’m still not ready to mess with lights. 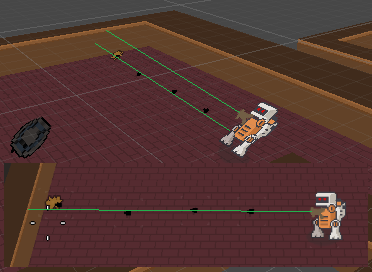 In short, side and front sprites have the same value, but also similar “to-camera-distance” values, which confuses certain shader setups as to what is to be rendered first. I also just removed the back face, because it’s never visible (I don’t rotate the camera). In short, fading top and front reveals the partly-faded side (double) sprites as well. 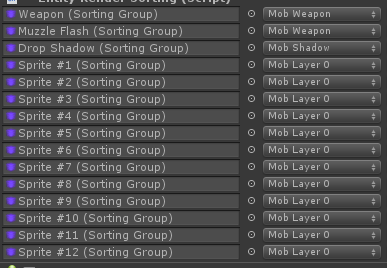 Basically, I have no choice but to code some logic to remove/hide these. 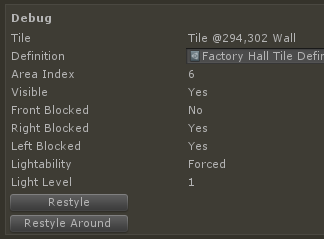 So if a tile has a visible neighbour, that side’s sprite gets hidden. I considered just toggling on culling, but this ends up breaking more things than it fixes, due to various shader reasons. I think I will just leave it as is — that is, good enough. And the visibility is then controlled by the blocked flag and this flag together. I can even color them the same as the background, thus making them essentially hide the wall back-sides. Although, I will likely keep them slightly different. I am now also using an (asset store) shader that renders pixel art much nicer when not pixel-perfect and when zoomed in or slanted. 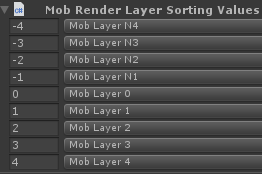 This lets me enable filtering on sprites and have the shader deal with precision “pixel-perfect blending”. There were a few issues with integrating this, but I got it all working in the end. It’s not a huge difference, but now my “incorrectly” scaled and rotate sprites no longer flicker like crazy and no longer blur to oblivion if smoothly filtered. The downside is that I lost all of my custom shader code to flash and tint the sprites. 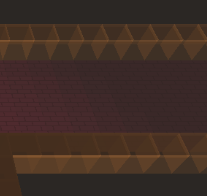 Although I think the shader code is simple enough where I could re-add this without too much trouble. At a later time. And that fixes the mobs back to what they were before, but now with 50 extra steps. 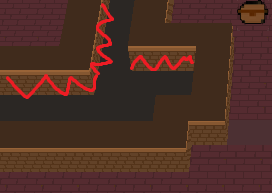 This is one of the things I can do in my 3D setup that I couldn’t do in 2D with fake walls due to the way “collisions” worked. Anyway, those are the major issues I’ve had recently. Hopefully, they are sorted now, although I fully expect more to come. Such is the price of doing semi-fake 3D.